but I recommended it a few times and the feedback was good. It´s in german just follow these links to reach the internal geared hubs (also ALFINE black & white and SRAM i-Motion 9). I’ve had an excellent experience with Petra Cycles. Even though they are across the Atlantic and a conversion from GBP to Canadian dollars, I would recommend them and plan to buy from them again. Good selection of Alfine/nexus parts. am i correct in syaing you have some torpedo hubs for sale? I am currently building a “modern” classic cafe cruiser. Am considering Cenrix NOS 3 speed or duomatic for a cleaner look. What do you recommend? How reliable are Centrix hubs? I have no experience with Centrix hubs. The F&S hubs are very reliable. I drive my Duomatic since 6 years (12 km per working day!). The DUO and AUTO decision is a price decision. Both hubs have a easy and reliable shifting mechanism. The AUTOMATIC hub is more special and rare! do you have any duomatic left? the are still some hubs left. If you encourage folks to buy online, then what incentive is there for brick and mortar IBDs (LBSs) to stock and service internal hubs? Best to buy from a local bike shop. there is little incentive for LBS. LBS also is unlikely to stock the range of products available from online stores, but they are highly likely to charge double or more. LBS is redundant. Repairing, selling used internal geared hubs and the spareparts. Here is the link to the Duomatic spareparts and hubs…. Please inform him in detail about the hub version you have. Because there are two Duomatic versions out there! Only Internal Gear Bikes with Rohloff, NuVinci, Shimano and Sram combined with Chain or Belt Drive. do you have any duomatic or automatic hub left? I work for Biketoolsetc and we are now stocking an extensive line of Sturmey Hubs and parts for old and new Sturmey hubs. We’ll be stocking the S3X “Fixie” Hubs by the end of Jan 2010. Just discovered this site, VERY useful. I’m trying to make this not sound like an advertisement, but folks are welcome to call (541-482-0222, business hours, US Pacific time) or E-me at larry@biketoolsetc.com for parts or hub availability. We have many parts not listed on our site (www.biketoolsetc.com) and are adding parts as we can find them. Also working on retooling some hard to find Sturmey spanners. We just received our first shipment of Sturmey’s S3X 3 speed “fixie” hubs in silver, black, gold and red. Available in 120mm and 130mm over locknut. Go to http://www.biketoolsetc.com and type SU-S3X into the search engine. Any questions you can reach me at larry@biketoolsetc.com. I might be off-topic for the site, but I’m looking for a Torpedo SINGLE-speed brake hub. I’ve had several bikes with such a hub, and they are WAY superior to what you get today, imho. However, it is very hard to find – does anyone know where to get it? And, in case the Torpedo hub cannot be found: What’s the best alternative, in your opinion? I bought one on a bike two weeks ago, and they are often available on bikes on ebay uk. sorry for my ask, I’d like to buy Duomatic…….I can from you….???? all the Duomatics are sold. Sorry! You can order a hub from Jens! are you sure website for the hub??? there are no hubs left! scheunefun.de domain name is up for sale. this link is no longer operational. i’m looking for a Duomatic hub with coaster brake 36holes for an old bike. Could you tell me where I can purchase one? Due to overwhelming demand, we have decided to offer spare parts to the Internet community. We are not discounting these. We service a lot of hubs here in Seattle so there is little incentive to blow them out. We expect our spare part stock to grow as time goes by. We are committed to importing and acquiring parts for hubs where ever we can. Importing from Germany and Japan when necessary! However, to help us all in the long run, encourage, by asking for, IGH spares and service at your LBS. This guy sells over-priced parts. Just get a quote and you will know. Starbike? Really? Besides Roholoff discounts, I did not find a single IGH hub for sale. 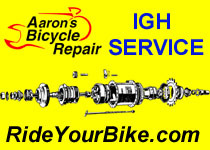 If ya’ll want IGH hubs and parts and service to become more available, you need to encourage your LBS to stock hubs and parts. Pay them to overhaul your hub! Foster a real-life relationship with the owner or service manager. When I started working in bike shops, overhauling a Sturmey-Archer 3 speed hub was considered a badge of honor and really, only the most experienced mechanics did it. Now with the internet and Youtube videos I am surprised how many shops cannot do it. And with Powerhouse, Shimano fully behind the IGH rennaissance, I am even more surprised at how hard it is to get a hub serviced! I just bought a new Shimano Alfine 8 IGH from http://www.rose.de. The price was the best I could find at the moment. Внимание, будьте осторожны! Тебя обманули? Добавь этого человека или организацию сюда stop-list.ru. черный список мошенники – полная база всех, кто кидает честный народ!